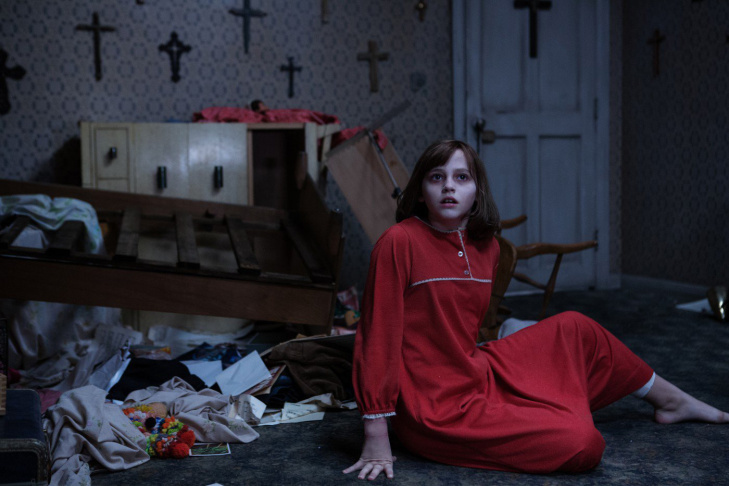 Madison Wolfe stars as Janet Hodgson in "The Conjuring 2." 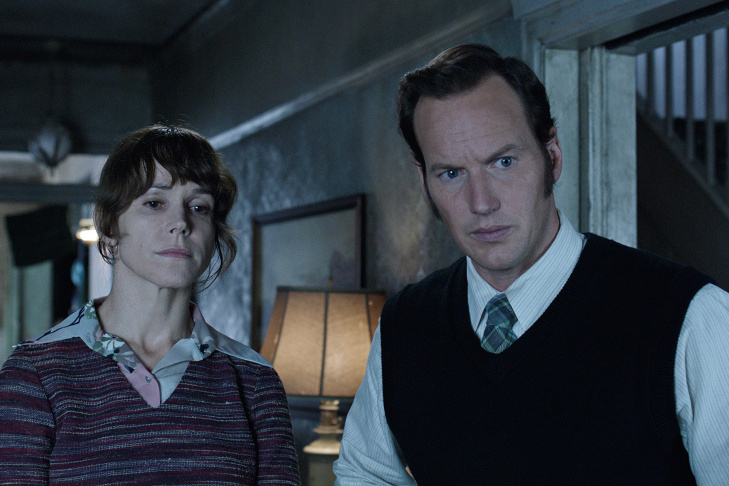 Frances O'Connor and Patrick Wilson in "The Conjuring 2." A scene from "The Conjuring 2," directed by James Wan. 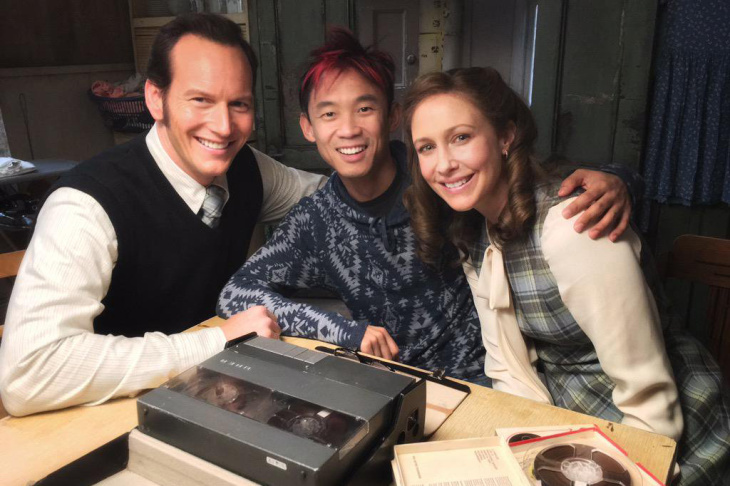 Patrick Wilson, director James Wan and Vera Farmiga on the set of "The Conjuring 2." 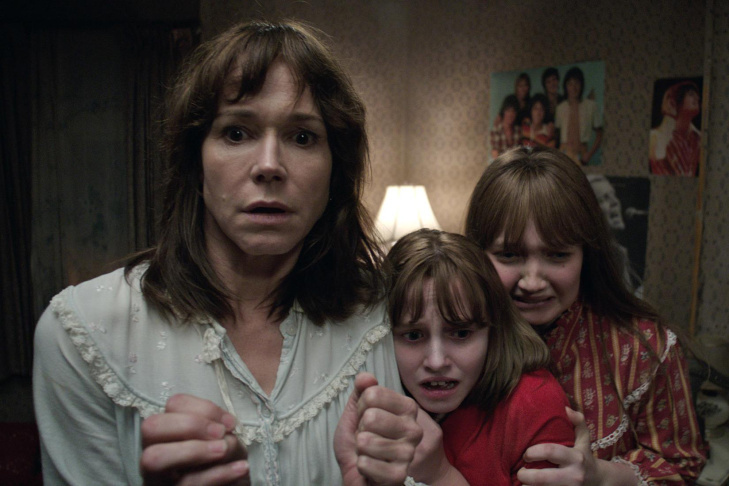 In "The Conjuring 2," single mother Peggy Hodgson and her four children are terrorized by a very angry poltergeist in their council house outside London. But the youngest daughter, Janet, who is played by newcomer Madison Wolfe, bears the brunt of his supernatural ire. Like "The Conjuring," the sequel is based on true events. This time around, it’s the well-documented story of the Enfield Haunting of 1977. Patrick Wilson and Vera Farmiga reprise their roles as paranormal investigators Ed and Lorraine Warren. 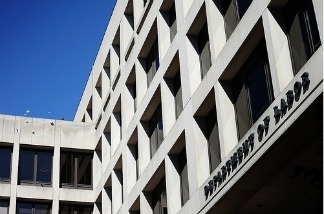 James Wan returns as director for the sequel. "The Conjuring" is a franchise Wan created, along with the "Saw" and "Insidious" horror franchises. But prior to returning to horror, Wan directed "Furious 7," an action movie with a $190 million budget. To put that in perspective, the budget for "The Conjuring 2" was $40 million — much less, but still quite generous for a genre film. Wan recently came by The Frame for a conversation with host John Horn. We begin with Wan discussing the challenges he faced in taking on an already established big-budget franchise. Up until "Fast and Furious 7," every movie I've made has been a film that I've created, franchises that I've created. "Fast and Furious" is the only franchise that I've directed that I did not create from scratch. So it definitely was an eye-opening experience for me coming to that world. I had to be respectful of the roles that had been established by the filmmakers before me and I was cool with that. 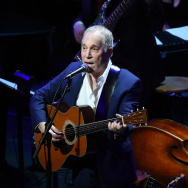 I knew that I was coming to play in someone else's playground, but the key for me was to find something that was unique and bring my own voice to this playground. You were doing a Twitter Q & A earlier today. In it you said, "Horror is really difficult to get right. People don't give it enough credit." Is it a little bit like comedy where if you're scared or you're laughing, people think it's not that hard to do? It really is. It's very difficult to get an audience to be terrified of what's going on. Think about it: You're in a room with so many other people, so for them to be terrified and to care about what's going on on-screen takes a lot of work. For them to be able to suspend the real world and be part of your world takes a lot of understanding of the genre and takes a lot of craftsmanship to get them there. 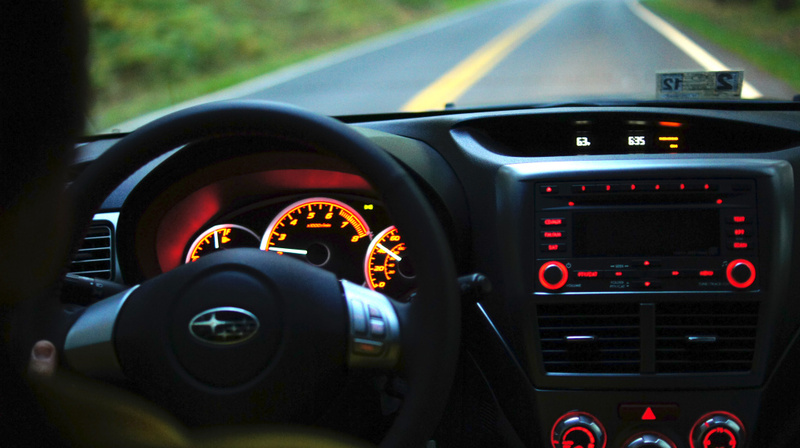 One of the things that is clearly really important to you is sound design. In one scene, a girl takes a chair and tries to wedge it under the doorknob. In the sounds of that scene, you hear the girl breathing, the chair, the score and the sound effects. Tell us about the elements that go into a scene like that? Just to give it a bit more context: That one moment is very important because I wanted to shoot the sequence where the little girl goes into the room ... to barricade the door. Then, when she runs to the bed, the camera follows her and we stay on her. 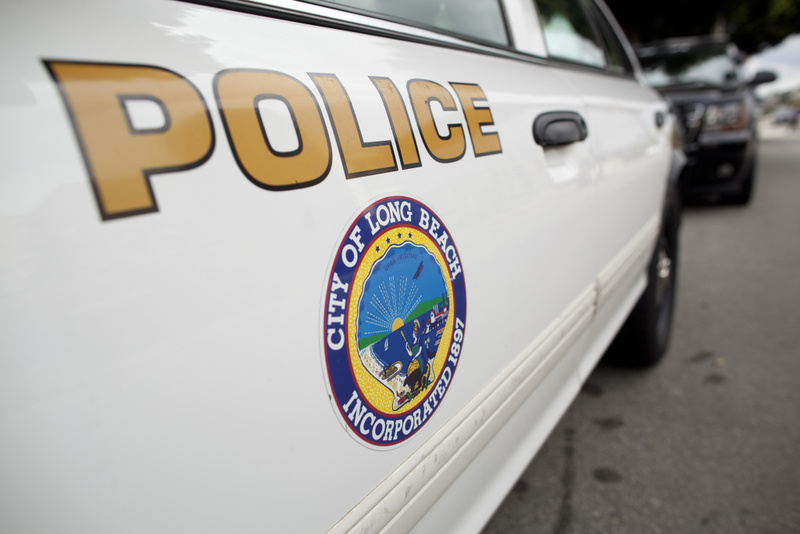 Off camera — we don't see it — we hear something getting thumped and then we hear something getting dragged away. I think that is the kind of stuff that sends a chill down your spine because you're not expecting that to happen. The fact that it all happened off camera and only using sound design, it just fires up your imagination even more as to what that could be. So much of all this is about building anticipation. For me, what usually makes a horror sequence scary is the journey not the destination. As part of that journey too, in this film in particular, you are very focused on how this film looks. It is noticeable that you have worried a lot about cinematography. You hired Don Burgess, who shot "Forrest Gump," "Castaway" and "Contact" — not a guy who typically works in genre. He did make one great genre film: "What Lies Beneath." Right, a $100 million genre film. In the "Conjuring 2," there are long tracking shots, complicated camera moves and very detailed images. In addition to sound design, why is the beauty — and I use that word decidedly — of this film important to you? My filmmaking tends to be very classical. Because of that, and because I'm a big fan of classical cinema and filmmaking, it's about what you can do with the camera work, what you can do with the sound design, what you can do with the music and editing toward crafting a sequence that means something and tells a story. Because of that, I really put a lot of emphasis on my camera work. I'm a very visual director and I think you can tell so much of a sequence by how you move your camera or if you hold your camera back. So the great thing about someone like Don Burgess is, having done so many of the great movies with [Robert] Zemeckis, I could throw all kinds of crazy camera work at him and he would rise to the challenge. So capturing the beauty of this movie is very important to me because I really wanted it to have that classical sort of atmosphere and a mood that we've come to love from a lot of the old-school horror films that we grew up with. When you see a young girl or a young woman in most genre films, you know very quickly that they are going to become a victim and they're not going to have much to do. But your actress, Madison Wolfe, who plays the young lead of Janet in this film, is more than a victim. She is her own person. She has to do incredibly difficult stuff in terms of performance. Can you talk about finding that actor and what she was required to do in that job. Listen, finding Madison Wolfe was the big, top secret for us. That role of Janet Hodgson is such a demanding role because it demands a kid to start off the movie really young and naive and innocent, then over the course of the film become more and more afflicted by the poltergeist that haunts her house. Then she becomes very troubled. We searched far and wide for someone who could play this British character because the true life story aspect of it, of Janet Hodgson, is so well documented. You can find stories about her. You can find so many things about her everywhere. So in looking all over England for this particular actress — we even searched all the way to Australia — I never for the life of me thought that I would actually find this particular actress of all places in Louisiana. 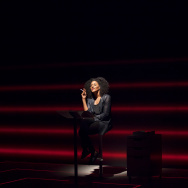 The thing that blew us away was that when she came in to have a first meeting with myself, the producer and the casting director, she came in wearing a wig [and] contact lenses, and she spoke in an English accent for the entire meeting. I was so shocked by how dedicated this 11-year-old kid was to her craft. I really think when people see her in this movie they're going to be so blown away by how gifted she is. I remember my casting director saying to me, "James I think that I've found the person for you. This is a young Jodie Foster." One of the things that's important, and I guess also a little tricky with a movie like this, is that it's based on a true story. How do you make sure that the people who are still alive, some of whom experienced this, are satisfied by your interpretation and that you follow the basic contours of what happened, but embellish it with enough dramatic invention so that it entertains? Yeah, that is a fine line that I had to walk here. You're right that a lot of the people that this story happened to are still around. I always say that I'm not making a documentary. I'm making a movie that is quite subjective. It's told through the point of view of the people that this happened to. And so, for that reason, I had to be respectful to these people. At the same time, I also take artistic licensing to craft what it is that I think the audiences want to see, which is a scary movie and to have a good time. 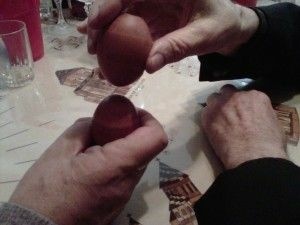 For me, it was about using the true life aspect and all the reported true life events and use that as a foundation to build my set pieces and to expand on the characters in the story. Your film is made by New Line and Warner Bros. A lot of genre films are made by independent companies or independently distributed ones. How important to you is it that big studios are getting back in the genre business and at a budget level that these movies often need? Yeah, that's really the thing, you know. We've seen in recent years, actually even way back to when I made my first movie, "Saw," which was an independent movie. It felt like all the good exciting and adventurous horror films were made from filmmakers from the independent world. The indie world really allows you to take chances and do things that are more out there that you can't really take if you were making a commercial horror film for a studio. 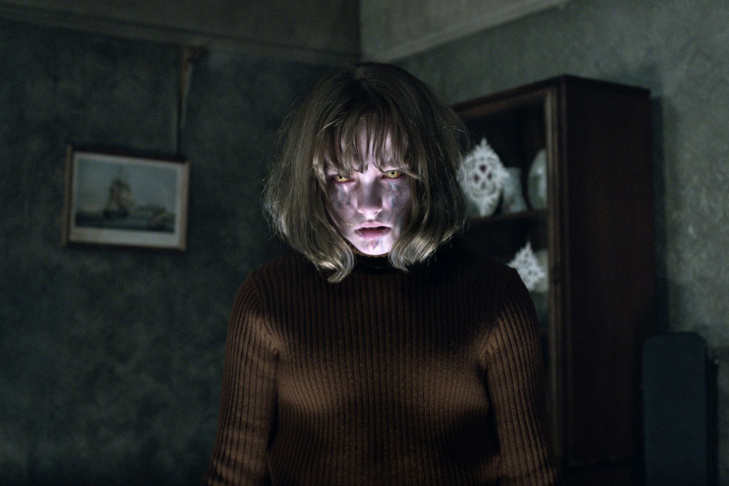 Of course, there are filmmakers who grew up watching "The Exorcist" and "Rosemary's Baby." Exactly, and that's a thing that I like to remind people, that all the movies that people and critics love were studio horror films made by respectable filmmakers. Kubrick. And Spielberg with "Jaws." These were really great respectable filmmakers. And so there's a part of me that would really like to push studio horror filmmaking back to the quality of the old days and remind people what it is that they love about those movies in the first place. It would be great to get these indie, horror filmmakers who have had success and give them the resources and the creative freedom to make their horror movies, but with a proper budget.